Everyone’s experienced that paralysing moment of fear when you get up in front of a group of people open your mouth to start speaking and realise you’ve totally forgotten whatever it was you were going to say. With a large crowd and free-flowing booze, weddings are one of the trickiest public speaking occasions even for the experienced orator. Fear not, however – here’s some tips to keep best men, bride’s fathers and grooms gabbling happily until the glasses are raised. Once you’ve been asked to begin by the MC, it’s time to get on with proposing a toast to your daughter and her new husband. Traditionally, the bride’s parents acted as hosts of the wedding, so begin with a few words of welcome for the guests, particularly the groom’s parents. Now’s the time for a few reminiscences about your daughter. If you’re stuck for ideas, think of funny incidents from her childhood, fashion disasters from her teenage years, or the first time you heard about her husband-to-be. Finish by expressing how proud you are of her before urging everyone to raise their glasses to the happy couple. The groom’s speech acts as a reply to the father of the bride’s words, in which you thank your new father-in-law for allowing his daughter to marry you, as well as your own parents for the care they’ve lavished on you since childhood. Try recalling family holidays or the times they bailed you out of daft adolescent mistakes for anecdotes that’ll illustrate your point. The job of thanking everyone for their presents also falls to you, so make your gratitude clear on behalf of yourself and your new wife. It’s usual for the groom to thank the bridesmaids for their contribution as well – often accompanying your words with a token of esteem – before handing over to the best man. Everybody will be anticipating this speech, but don’t neglect your official duties in favour of gag after gag. The best man speaks up on behalf of the bridesmaids to thank the groom for his gifts, and also acknowledges the contributions of the bridal party to the wedding. This should include toasts where appropriate, especially in the case of the bridesmaids. Now the bit you’ve been waiting for – the chance to make the groom’s toes curl as you reveal some of his finer moments. Mention how you met him (assuming you’re not related – if you are, go for childhood anecdotes), reminisce about the day he told you he was getting married and throw in as many stories as you can in between. 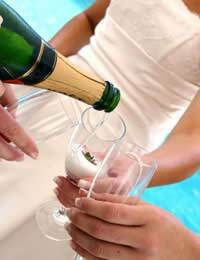 Finish with a flourish by proposing the second toast to the bride and groom – and try not to down your champagne in relief afterwards. It’s quite in order for the modern bride to make a speech as well as the men. Base your speech on that of the groom’s – thank your in-laws for welcoming you into their family, as well as your own parents for bringing you up. As it’s such a new part of wedding etiquette, there aren’t any formal requirements for the bride’s speech, but you can always share the groom’s obligations with him. For example, if he’s going to thank people for their presents, you should be the one to mention any absentees. It’d be very unfair to leave people with the best man’s view of the groom, so throw in a few words about your husband, how you feel about him and why you decided to marry him. Why not finish off with a toast to the best man and ushers for getting your husband back to you in one piece after the stag night? Shorter speeches are invariably better than long ones. Anything longer than five minutes for all but the best man (who shouldn’t go more than seven or eight) is going to tax your guests’ patience. If you’re giving out thank-you gifts, do it near the end of the speech so there isn’t a lot of stopping and starting. If you’re worried about telling jokes as part of your speech, the best advice is not to try. Simple, heartfelt words or amusing anecdotes will go down much better than a forced gag. Those who do want to include jokes should be prepared for them to fall flat – a line like ‘Apologies, I was testing that for another best man. I’ll tell him it doesn’t work,’ will smooth over the moment and allow you to carry on. Speech cards are useful prompts and will prevent you forgetting to thank people or losing the thread of what you were saying halfway through. Don’t bother writing your entire speech out – it will sound horribly forced when you come to deliver it. Prepare in plenty of time so you have the chance to practise before the big day. The more times you go over your words, the better chance you’ll have of delivering it perfectly under pressure. Best men and fathers of the bride – avoid mentioning ex-partners of the bride and groom. Comparisons will only embarrass everyone, particularly if the people in question have been invited to the wedding. Don’t make personal allusions to relatives of the happy couple unless you’re sure they’ll be taken in good part. Saying you’re glad everyone’s been fed so well on the budget your father-in-law provided isn’t going to win any Brownie points. Leave out offensive and ribald jokes, which are liable to upset older guests and have younger ones begging their parents to tell them what it means. And no matter how much you’ve had to drink, don’t swear. Finally, remember only ten per cent of what you’re saying to the audience is coming out of your mouth. If you seem tense, nervous and liable to break down at any moment, they’ll feel that way too. Nobody wants you to fail – so take a deep breath, stand up, smile and knock ‘em dead before the dancing begins.